The good people at CAD Lights Aquariums have joined the pico and nano markets with their recent addition of 4, 8, and 20 gallon Mini Series tanks. CAD Lights Aquariums is better known for their 39 gallon all in tank plus sump setups, but with the help of the exceptionally well priced Mini Series’, their name will be tossed around a bit more. The Mini Series tanks come equipped with stellar 2 or 3 panel LED lights. The LEDS come equipped with a remote control, dimming capabilities, and white to blue spectrums. 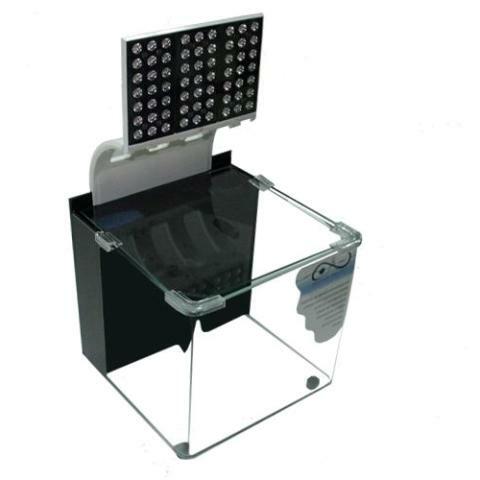 Each LED has an individual reflector and lens for ultimate exposure. As with all CAD Lights systems, the Mini Series tanks are made with glass not acrylic. The corners are gently rounded not seamed, creating phenomenal viewing. The CAD Lights Mini-Series offers a lot of personality and the prices range from $124.99 – $319.99. A total steal for such an impressive system.